New in 2018! I'm adding Alpha s1 Casein results for all goats. Alpha s1 Casein is one of the most important proteins in cheese making. The A and B variants are associated with high content of Alpha s1 Casein. Click on the picture to go to a doe's page. A and B variants, are associated with a high content of alpha s1 casein in milk, which is beneficial for cheese production. Holy mother of all blessings, Batman! I never once imagined that Clover would be able to join the Owlhaven herd, and then BOOM! It happened. To give you a bit of background, earlier this year someone asked me, if you could have any buck in the world, who would it be? My immediate response was "Cleveland Sage." I've loved that buck since I first met him years ago, before he had proved himself through his daughters. Of course, the last thing I need is another buck, given my large herd of exceptional males. Fast forward to 2017, and I am welcoming Cleveland Sage's full sister to my herd. Welcome, Clover, to your forever home! 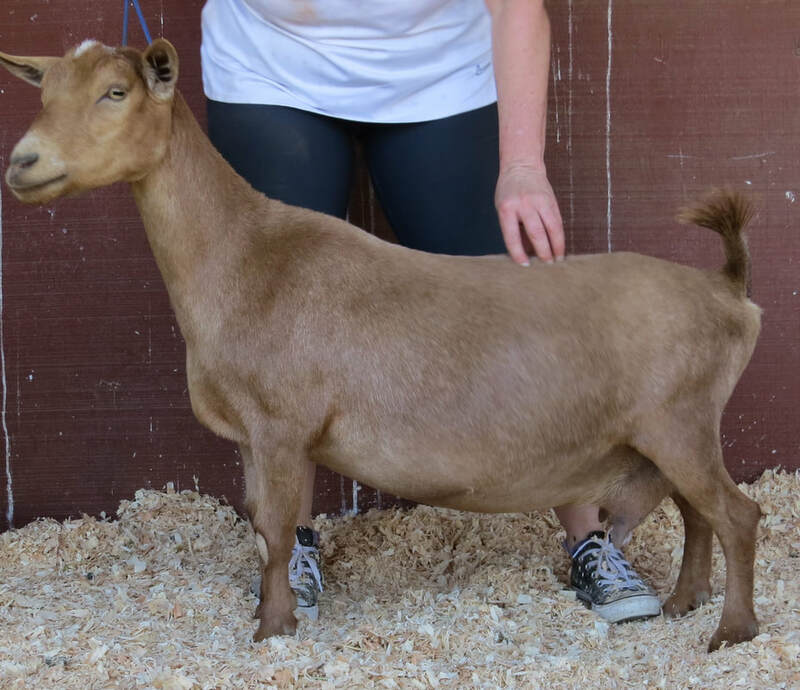 Here is her breeder's description of Clover: "Clover is long bodied, and dairy, with elegance, femininity, good brisket extension and angularity. Her udder is well attached with an exceptional amount of foreudder extension, a good MSL and teats that are large, plumb, and easy to milk." ~ Sarah Hawkins, Castle Rock Farm. Photos courtesy of Dill's-A little Goat Farm. Photo of Manuka Honey courtesy of Heather Manzo, Sierra Aspen Ranch. Photo of Snownamie courtesy of Sarah Hawkins, Castle Rock Farm; photo of Manuka Honey courtesy of Heather Manzo, Sierra Aspen Ranch. Photos of Annnie courtesy of Addie Pepoli, Proctor Hill Farm; Photo of Nuke courtesy of Heather Manzo, Sierra Aspen Ranch. Does that kidded for the first time in 2019. Photos of Intrigue and Rivers End courtesy of Ellen Dorsey, Dill's-A little goat farm. Dam: GCH Dill's W Intrigue 2*M 6-03 EX91 (EEEE) - 2018 ADGA National Show winner of Life Time Production and Life Time Butterfat awards! 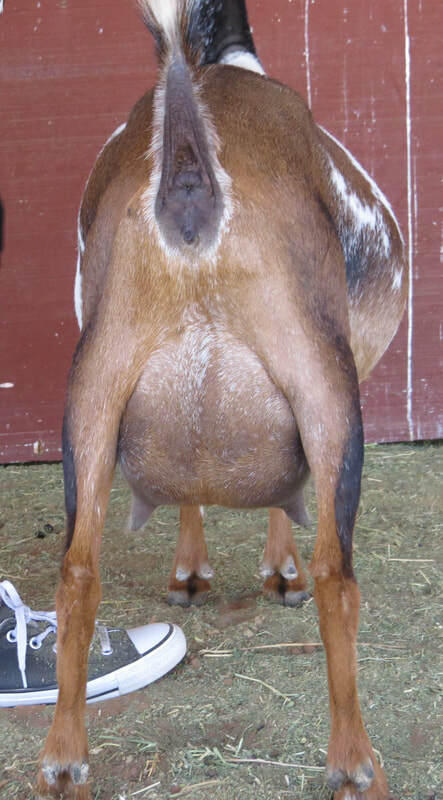 Skuttlebut's dam, Intrigue is an exceptional doe, scoring 91 EEEE two years in a row, placing first and first udder in her class at the 2012 Nationals, and placing second and second udder in her class at the 2013 Nationals. Five of her daughters have been LA'd and all have done very well for their age groups, with one daughter going 90 VEEE as a three year old. Owlhaven's own Dill's GA Fascination just scored VVEE 90 under one of ADGA's toughest appraisers (and might have done better with a more skilled handler, I'm not the best). Photos of Annie courtesy of Proctor Hill Farm; photos of Isabella courtesy of Cedar View Farm. Alegria is a beautiful, blue-eyed daughter of Annie, one of the finest does to grace the farm and a doe who has consistently received high scores in linear appraisal. Annie is also a strong milker, and I expect the same from Alegria. Alegria is long bodied and balances dairyness and strength. She is wide and deep throughout, with great openness in her escutcheon area and between her hocks. She levels out beautifully on the move. I expect her to go ELITE and Superior Genetics when she matures. These does are scheduled for breeding for 2020 kids, as two-year old first fresheners. An Alum Root granddaughter! This is special because Alum Root is the dam of some exceptional animals, including Castle Rock Cleveland Sage, 3x ELITE Buck, sire of numerous finished champions, and sire of numerous does who have received excellent scores in Linear Appraisal. She is also the dam of our own SGCH Castle Rock Owl's Clover EX90 and the granddam of Owlhaven MH Buddleia, a doe with exceptional general appearance and correctness. She is also special because after this kidding I am retiring Coral Bells. She's been exceptionally productive for me and has earned a long, healthy, and happy retirement. Welcome to your forever home Octavia! - This is a 1.6% linebreeding to SGCH Rosasharn's UMT Tupelo Honey 4*M an a .1% linebreeding to SGCH Rosasharn's TL Zenith 3*M.
- This is a 2% linebreeding to SGCH Rosasharn's TL Zenith 3*M.
Pictures of Snownamie courtesy of Sarah Hawkins, Castle Rock Farm; photos of Gunner and Wedding Proposal courtesy of Heather Manzo, Sierra Aspen Ranch. First choice doeling or buckling will be retained. Annie's name is a good place to start when it comes to understanding all the code associated with the American Dairy Goat Association performance programs. Her name is SG Proctor Hill Farm Pistol Annie 2*M 5-02 EX90 (EEEV). SG stands for Superior Genetics, a designation that Annie earned based on her linear appraisal scores (quality of conformation compared to an ideal goat) and milk test results (how much milk and percent of butterfat). Her dam is SGCH, which means she is a finished champion and superior genetics. Proctor Hill Farm is the name of the farm that bred her. 2*M means that she is the second generation on her maternal side to earn a milk star. 5-02 is her age at the time of linear appraisal. She was five years and two months old. EX90 means that she is excellent with a final score of 90. Only one Nigerian has received the highest score of 93. EEEV is the abbreviation for her scores in the four major categories evaluated in linear appraisal. It means that she scored excellent in general appearance (category 1), dairy strength (category 2), and body capacity (category 3), and very good in mammary system (category 4). ELITE is a designation awarded on the basis of a complex genetic calculation that focuses on milk production. Sires and dams that receive the Elite Buck or Elite Doe designation is considered to be in the top 5% of the nation genetically with regard to milk production. EX or E = Excellent = 90 and above, 91 and above are relatively rare in the breed. 93 has been awarded to only one goat in the history of the breed. Goats are considered mature at five years of age and receive their final linear appraisal scores at that time. Younger goats typically receive lower scores because their bodies are immature compared to the ADGA "ideal" goat. In human terms, imagine comparing an awkward 13 year old with a perfect "10" supermodel like Gisele Bündchen.